What do Ernest Hemingway, Marilyn Monroe, and Neil Armstrong have in common? Other than being American icons from the first half of the 20th century, they were all patrons of The American Bar! This Art Deco bar in the Savoy Hotel is the oldest surviving "American bar" in London (which get their name from serving American-style drinks--cocktails). It opened in 1893, but moved to its current location in 1904. These bars grew in popularity as trans-Atlantic travel became more common, and for the poor Americans who were not allowed to "manufacture, sell, transport, or import" alcohol stateside, it was a bit of home away from home. 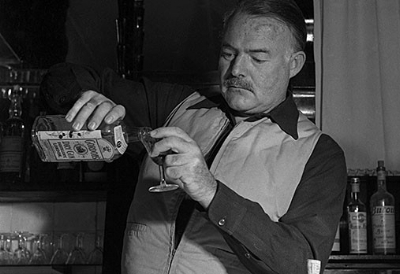 One would not be surprised to find Ernest Hemingway ordering a Montgomery, Marilyn Monroe sipping Dom Perignon, or Neil Armstrong enjoying his first alcoholic drink after the moon landing--aptly named the Moon Walk--as well as many other international celebrities enjoying the bar's cocktail creations, such as Vivien Leigh, Charlie Chaplin, and Mark Twain. Throughout its years as a top destination for artists and businessmen alike, The American Bar became well-known for the caliber and inventiveness of its bartenders. 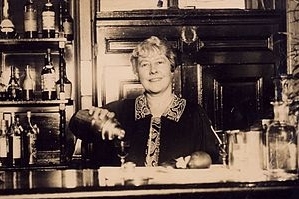 Ada "Coley" Coleman is often credited as the first of only two female head bartenders at the bar, as well as the creator of the Hanky Panky, a variation on the sweet martini. She was inspired to make the drink for her friend, comedic actor Sir Charles Hawtrey, who was overworked and often came in for a drink. When she set her concoction in front of him, his first reaction after tasting it was, "that's the real hanky-panky!" The name stuck. When Coley retired in 1925, infamous bartender Harry Craddock replaced her, having left the United States several years earlier to avoid Prohibition. Legend has it (and Harry was fond of boasting), that he served the very last legal drink before Prohibition began. It is due to his cutting-edge mixology that we now enjoy cocktails such as the White Lady and Corpse Reviver #2. His 1930 book, The Savoy Cocktail Book, remains a reference staple for bartenders around the world. You too could be serving dry martinis, Hanky Pankys, and Moon Walks (although admittedly at much cheaper prices) at your very own Art Deco bar! 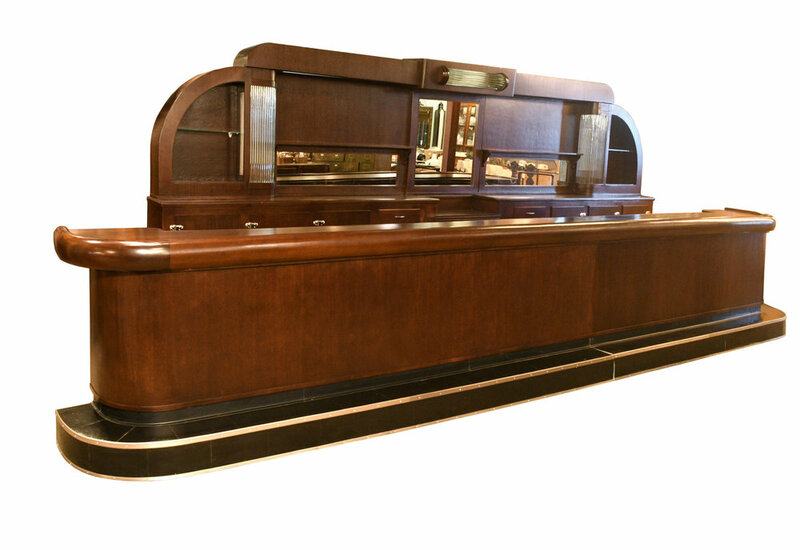 This beautiful walnut showstopper has been professionally restored to look like it just stepped out of 1935 Chicago. Come in to take a look, and imagine the literary conversations, shady business deals, and lifelong friendships that may have started there!